Celebrating 100 years since the formation of Czechoslovakia, the Consulate General of the Czech Republic in Los Angeles, in cooperation with the Czechoslovak Society of Arts & Sciences in Los Angeles, presented a duet performance of two acclaimed Czech musicians, Miroslav Ambros (violin) and Zuzana Ambrosova (piano) on Friday, March 23, 2018 at 7:00 pm. Violin virtuoso Miroslav Ambros plays a very rare instrument made in 1734 by the Italian violinmaker, Camillo Camilli and lent him by the Czech National Museum. 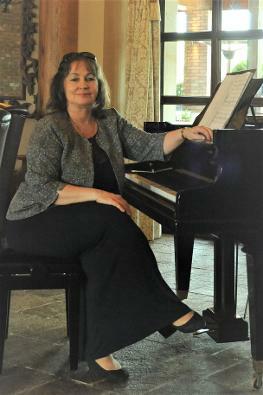 Zuzana Ambrosova is a celebrated pianist lauded for her accompaniment. 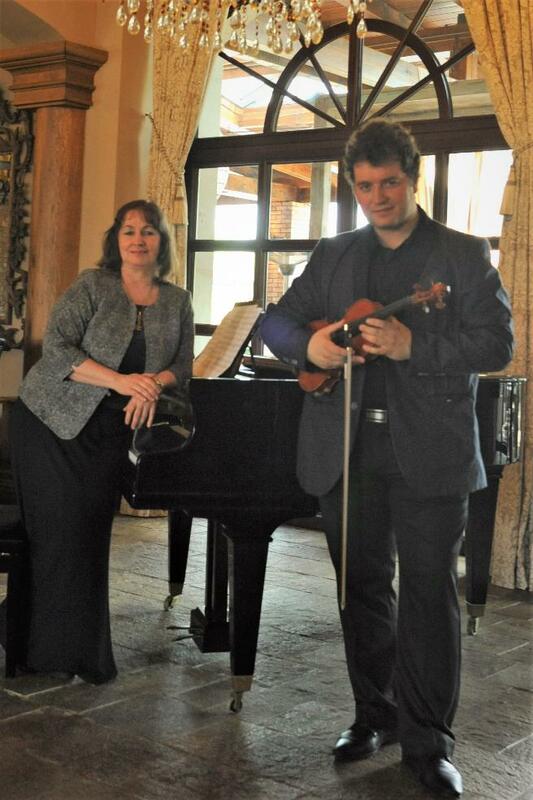 The two performed selections from Smetana, Dvorak, and Janacek as well as from contemporaries, the late Josef Suk, Peter Breiner, and Sylvie Bodorova. At the mere age of 11, Miroslav Ambros chose the violin as his career when he was accepted to Jan Neruda High School in Prague to study under Professor Jiri Hnyk. Also advised by Prof. Ivan Zenaty, he graduated summer classes in Canada led by Pinchas Zuckerman, Professor of Manhattan School of Music. Beginning in 2008 he was a private student of virtuoso Josef Suk. 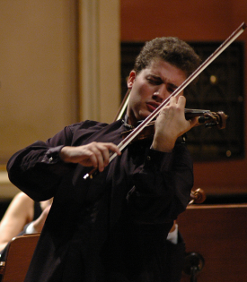 Miroslav Ambros received his Master's degree in 2012 but had already won numerous awards such as “Du Prix des Jeunes Talents Européens de Musique Classique” (France) in 2003 and Yamaha’s scholarship in 2004, Prague Junior Note, Bohdan Warchal and Kocian’s Violin Competitions, and Concertino Praga 2006. Miroslav Ambros hails from Prague where he is a favorite as a concert soloist and performs at prestigious concert halls there and throughout the Czech Republic as well as abroad. 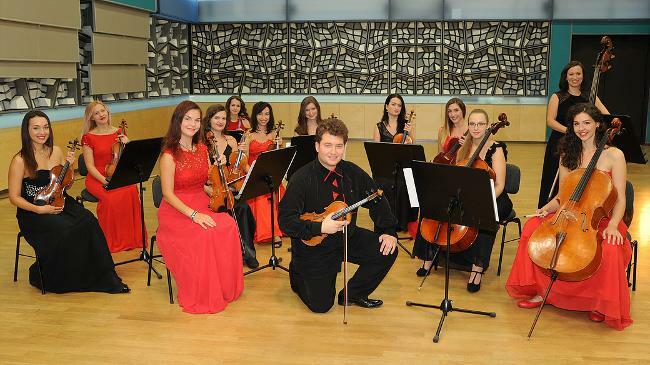 Having performed nearly 1000 concerts and appearing regularly with symphony orchestras such as Prague Chamber Philharmonic Orchestra, Prague Symphony Orchestra, and Czech Chamber Orchestra, he founded a unique ensemble in 2017, Ambros Ladies Orchestra, in which he solos. He was also invited to play in opera Garnier in Monaco in the presence of Prince of Monaco. Zuzana Ambrosova entered the Conservatory of Košice in 1973 at age13. A laureate of the Smetana Piano Competition in Hradec Kralove (1974) and the Beethoven's Hradec Competition, she joined the Kosice National Philharmonic Orchestra when she was only 16. After completing her studies under Prof. Zdenek Jilek at the Academy of Musical Arts in Prague in 1982, she spent ten years teaching piano at the Conservatory of Kosice. She has performed with the Kosice and Vienna Philharmonic Orchestras as a soloist, not only in Slovakia and the Czech Republic, but also in Germany, Austria, Poland, Hungary, Spain, France, Croatia, Bulgaria, Netherlands, and Italy. Since 1992 Zuzana Ambrosova has been teaching at the Prague Conservatory and Jan Neruda High School. She performs regularly for radio and television, and she has recorded a CD II Virtuoso with violinist Miroslav Ambros, published at Arco Diva. Following the concert, I had a brief talk with Miroslav Ambros about the performance. KINOCaviar Which one of these pieces is more the signature of you, what you play, how you play it, who you are? Miroslav Ambros What is my favorite, you mean? KC Well yes, which one is the most “you”? MA In which piece I can see myself the most? I really like Antonin Dvorak “Mazurek” E Minor; it’s a very nice piece, and also, I have a heart inside, because I did this composition with Master Suk. KC Did he teach it to you? MA Yes, this composition, and he taught me in Josef Suk Atelier, his studio, and now I have this studio after him. KC Is it in Prague? MA Yes, in the center of Prague in a place called the “Kampa,” Esimiri Kampa, and sometimes when I’m practicing this piece in Josef Suk Studio, I have such memories of working with him, because he was really wonderful, not only as a violinist but also as a teacher. KC And which of the pieces is the most challenging, the most difficult for you? MA Probably the last one, that I played as an encore, from Antonio Bazzini, “La Ronde des Lutins.” In English it’s called “The Dancing of Goblins,” and this is one of the most challenging pieces because it’s one of the most difficult compositions for violin generally. Playing it is like bungie-jumping, a little bit, for the fingers. But also, as I said, “Mazurek” in E Minor is a very difficult composition from the other side, because you have many lyrical passages, difficult places for vibrato, for some romanticism in the music, and for all pictures of this composition. KC Did I see at the beginning of your performance that a string from your bow broke? MA Yes, a piece of horse hair from the bow. It’s quite common – it happens often. Not so usual is a broken string from the violin, and it’s a very difficult situation because it’s necessary to change it to a new one, or if you’re playing with an orchestra, you can trade violins with the first violinist, the concert master. But also, I’m playing a composition from Niccolo Paganini, “Moses Fantasy,” and he composed it only on the G String, so you can have also the next possibility – you can play this composition – only on the G string! But, of course, the usual situation is it’s very difficult, and it’s mostly necessary to change it for a new one. KC Are you able to change it yourself? MA Yes, but – Well, I did it one time. I played in Bologna in Italy, and it happened two pages before the end, and I had to change it, and okay – mostly the public liked it because it’s a very natural occurrence, and sometimes people like it because it’s something different from the usual situation. KC My last question is about the instrument itself. You’re playing on this very special instrument, on loan? MA Yes, usually I’m playing on an instrument by Camillo Camilli, an Italian violin from 1734. I have this instrument from the Czech National Museum. But unfortunately, I haven’t got it here because we had a problem with the visa for the USA. It’s possible to go with this all through the European Union, but because this instrument is very expensive, there are many more visas for it. That’s why I’m here playing a violin by Karel Vavra, a Czech violin maker, from 1993, but I think for this place, for chamber music, it was also a good choice. KC So, when you play on the other violin, what is the difference in the sound? KC This one has a lot of sound, I felt – it really filled this room. MA And if I’m playing in an orchestra, a violin concerto, I’m usually playing with this instrument because it’s necessary to have more sound, since orchestras are often quite noisy. KC And is there one of the pieces you played that you would say is your favorite? MA Maybe also “From My Homeland” by Bedrich Smetana is a very nice piece, and also the Janacek. I like playing it because it’s a very deep piece. And I feel both compositions are evergreens from Czech classical music. KC You know, I read about Peter Breiner, and he seems so unusual, and even from his TV shows, a bit controversial. MA Yes, he’s quite popular. KC Well I wasn’t expecting this kind of music from him, because he seems to do so much pop, and arrangements. MA And then this composition is more classical. Originally it was written for violin and chamber orchestra. That’s why maybe we will play it with my Ladies Orchestra, which I founded. I had a meeting with Peter Breiner in New York, because we had a first concert there, and we spoke a little bit about this composition. He said he wanted to be more classical in these pieces, opposite to his usual style. KC It’s very modern – almost like Schoenberg, or someone like that. MA Something like this. You can hear there are also some really lyrical passages, which are not so usual for contemporary music. That’s why I also played this – because I like it. And I think sometimes it’s necessary to play some contemporary music, not only the classical, from Bach to Tchaikovsky. KC And Peter Breiner was the only Slovakian composer you played tonight, right? MA Not the only one, because Sylvia Bodorova was born in Slovakia, but she’s living in the Czech Republic. MA Yes, and also it’s a wonderful encore piece after playing in an orchestra. It’s a very popular composition for the audience. KC Well, I read about her, too. She asked, “Why compose music like the classics? What’s the point?” She feels you have to compose music from what’s around you, what is now. That was interesting to me. MA Especially in Bodorova, you find pieces of gypsy music. KC Which to me is very old, and authentic, and traditional. Gypsy music – you recognize it any time. So I didn’t quite understand her comment, but I think she relates to the spirit. Well thank you very much, and have a good trip back to Prague!